Over the past two years I’ve spent nearly three months of my days in the beautiful country of Spain. I’ve seen a lot of it’s wonders. And yet, here I am at the ‘End of the Earth’- totally surprised and in awe of this beautiful rugged coast – unlike anything else I have seen in Spain. Finisterre & Muxia are located on the Coste de Morte (Coast of Death), at the most western spot in Spain (and some argue in Europe). Located in the autonomous community of Galicia, both Spanish and Galician is spoken. The Coste de Morte is named thus because of the countless shipwrecks that have occurred on this rocky coast over the millennia. the time, bus tours are available so pilgrims can come and see the historic and beautiful location. It was Saint James who brought Christianity to the Iberian Peninsula. In 44 AD, he was beheaded in Jerusalem and his remains were brought back to Galicia. Following Roman persecutions of Spanish Christians, his tomb was abandoned in the 3rd century. In 814 AD, legends have the tomb rediscovered, and King Alfonso II of Asturias and Galicia is responsible for ordering the construction of a chapel to house the tomb, on the site where today’s Cathedral stands. This created the gradual development of the pilgrimage to the tomb. As pilgrimage to Santiago grew, pilgrims also started arriving in Finisterre to worship and see the “End of the Earth”. The first hospital (hostel) was built in 1479. For the people of ancient times, the Costa da Morte was the last redoubt of explored land, the westernmost part of continental Europe, the final stretch of an itinerary traced in the sky by the Milky Way. Legend has this ‘End of the Earth’ also as the place where pilgrims would collect a scallop shell, to prove they had made the journey to the sea. 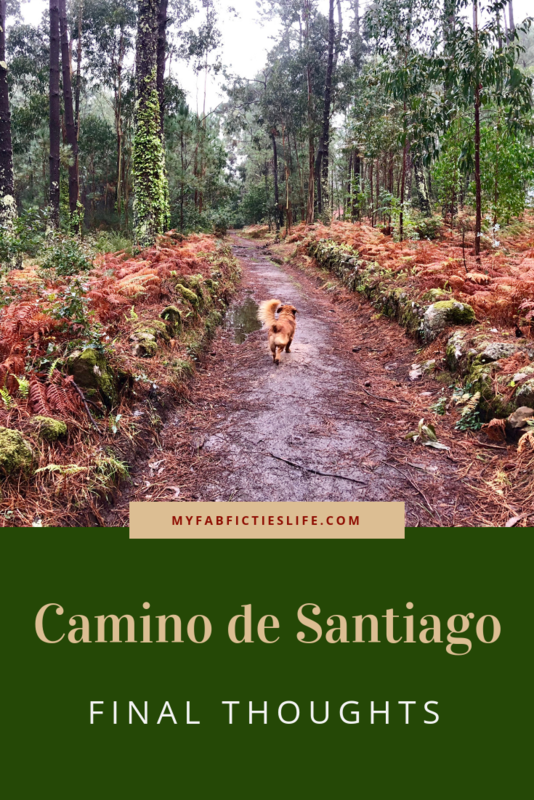 The scallop shell has many meanings to pilgrims and the Camino de Santiago, read about that here. So visiting Finesterre and Muxia was something we wanted to do. We had the time and seeing the Atlantic Coast of Spain was high on our list. Although the weather is cool and cloudy I’m still glad we came. The stormy coast is a great place to relax and enjoy a few cozy days before we continue on our journey. The End of the Earth as we know it. And I feel fine. We had planned to walk from Santiago de Compostela on to Finisterre on the Atlantic and then on to Muxia. That was always our plan. But two major factors created a need for us to reevaluate our plans. Gotta be Flexible in our Fabulous Fifties. Gotta be flexible on the Camino de Santiago. thermometer dropping into the 30’s…unseasonably cold for Spain in late October. Our last day hiking left me stiff and sore and it took me hours to thaw out. The second reason came just as unexpected as the freezing weather. We learned on the day we were walking into Santiago that the courier service we have been using to transport our bag only operates through the end of October. Wait. What? Shouldn’t they have mentioned this to us a little earlier? We can’t walk the Camino de Santiago with a roller suitcase, even though it’s not very big. With at least five more days of walking, we sat down and reevaluated our plan. fascinating, spiritual and worthy of respect. We took all the obligatory photos, picked up our Compostela (certificate of completion) and had a delicious dinner and lots of wine to celebrate and warm up. While drinking wine and eating Spanish tapas we made the decision to take the bus to Finisterre instead of walking. So a four-day walk became a three-hour bus ride. We are here in Finisterre for two days and will walk and see some of the Camino sights here, as well as enjoy the bounty of Galician seafood. With the weather forecast improving, we plan to walk on Friday the 20 miles to Muxia and send our roller bag via taxi to meet us there. Hopefully this will work out, and given our extra time, we can relax and enjoy a comfy Airbnb in Muxia for five nights. I’ll certainly be blogging on how these plans unfold. Fingers crossed. In the meantime, feeling accomplished to have made it this far. I have no need to prove anything to anyone including myself, so I am perfectly happy with our current plans. And watching the weather forecast with a hopeful heart for a warming trend in the days ahead.